CaesarJ is an aspect-oriented language which unifies aspects, classes and packages in a single powerful construct that helps to solve a set of different problems of both aspect-oriented and component-oriented programming. The paper gradually introduces the concepts of the language and illustrates them by showing how they can be used for noninvasive component refinement and integration, as well as for development of well modularized flexible aspects. 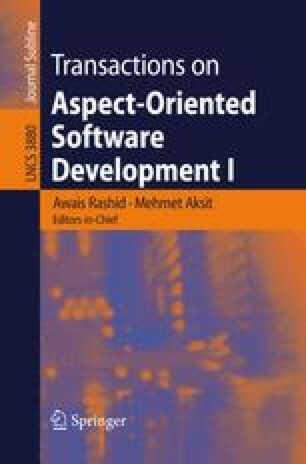 In this way we demonstrate that the combination of aspect-oriented constructs for joinpoint interception with advanced modularization techniques like virtual classes and propagating mixin composition can open the path towards large-scale aspect components.